The letter — whose signatories include some top bundlers for President Obama’s campaigns — underscores a nervousness among some in the party about Clinton’s standing and a building hope that Biden will decide to run. Some, such as party fundraiser Lou Frillman, had already signed up to help Clinton’s campaign. A wide swath of party financiers is convinced that Biden will make a late entry into the race, and a sizable number are contemplating backing him, including some who have signed on with Clinton, according to more than a dozen top Democratic fundraisers nationwide. Many of the president’s fundraisers are still up for grabs. Of the 770 people who collected checks for Obama’s 2012 reelection bid, just 52 have signed on as a “Hillblazer” bundler for Clinton or have held a fundraiser for her, according to a Washington Post analysis. Top Democratic money players — many of whom spoke on the condition of anonymity to describe private conversations — said discussions among senior Obama fundraisers about Biden’s possible bid have taken a serious turn in the past few days. The vice president’s team of advisers are still honing what would be his campaign message: That after inheriting a brutal economic recession, President Barack Obama has had a successful run, and Mr. Biden would keep the U.S. on the same trajectory. The Democratic debate next month is one of two important events in October that are on the minds of Mr. Biden’s top advisers as they consider a campaign start date. Stretching out the announcement has other pitfalls. Mid-November brings the first in a series of deadlines to get on the ballot for the first caucuses and primaries in 2016. Meeting those filing deadlines requires money and, in some cases, petition signatures, so preparations would need to begin weeks in advance. Drawing the decision out to November has risks, they know: It’s a gamble between whether she’ll implode (perhaps under indictment over her personal email server), whether he could wait so long that she’d rebound (perhaps fueled by strong performances at the debate or in congressional testimony on Oct. 22). …Taking his time might mean missing deadlines. There are petition and paperwork requirements that will quickly pile up as the end of the year nears. But in the topsy-turvy circumstances that would have to click into place for Biden to have any kind of realistic shot at the nomination anyway, he might have to make the campaign happen without being on the ballot in every state. Few are convinced that would matter much. If Biden’s serious about actually running for president, Trippi said, he’s got to move quickly to assess whether he has the support on the ground in the early states, and among key constituency groups, from labor to African-Americans. But if he’s hoping to just be handed the keys to the Oval Office, he’s got lots of time. It would seem a very risky move to sit back and hope that Clinton implodes to the point where she leaves the race. Even if the news were to become far worse for Clinton, she would probably remain in the race if at all possible, even if her chances of winning a general election campaign were to become greatly diminished. If Biden wants one last shot at the presidency, I think he is best off getting in the race soon, ideally in time for the first debate. However, if Biden does not enter the race, it is a safe bet that he will never close the door to accepting the nomination should Clinton somehow be forced out of the race. Update: Some reports recently have suggested that Jill Biden was reluctant for Joe to run. 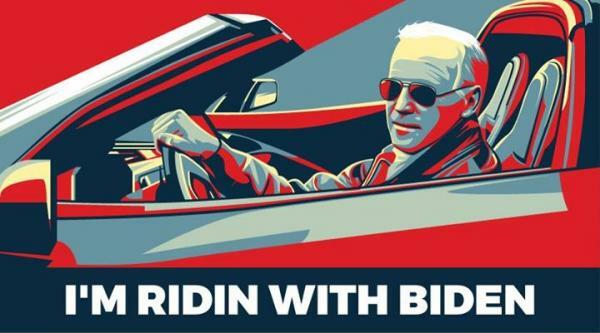 Today NBC is reporting that sources are saying Jill Biden is 100 percent on-board with Joe running. « Bernie Sanders “Wins” GOP Debate & Makes Cover Of Time–Will He Get To Debate Hillary Clinton More Than Six Times?